Homeowners will love this chainsaw’s user-friendliness and efficiency. The WG303.1 provides sufficient power for cutting tasks in the backyard (and related projects). Electric chainsaw reviews are incomplete without its review. Aside from its practical features, the WG303.1 is also quite affordable. It is ideally balanced and has features that even amateurs can understand and use (but even ‘amateurs’ should know how to properly grip and work with a chainsaw). 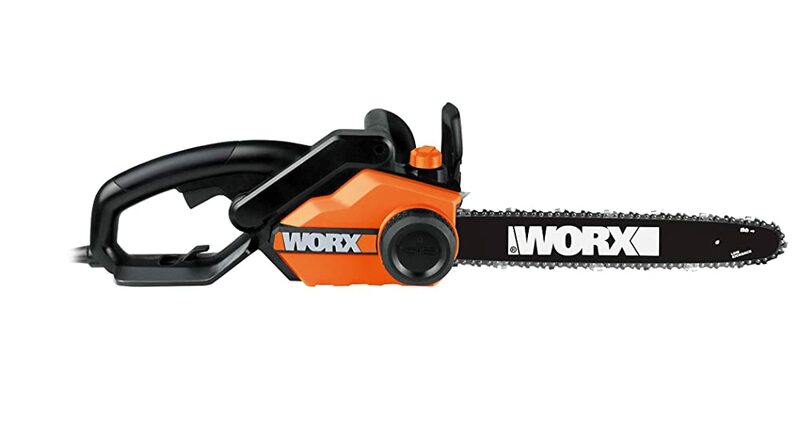 This WORX masterpiece helps with yard work, woodcutting, post-storm clean up, etc. Chain lubrication is automatic. There is a built-in oil tank (6.75 oz) as well as a level indicator. It is capable of working at 5hp (peak value) and 14.5 amps; equivalent to a gas chainsaw. Its voltage requirements are 120 V~60 Hz. The safety chain-stop feature complements the low kickback bar design element. It has a 3/8 inch kickback chain (pitch-reduced) and a chain gauge of 0.50 inches. It requires no extra tools to install and tighten a replacement chain. The rear handle is rubberized, over-molded, and provides ergonomic grip and handling potential. The full-wrap front handle does the same. The chain itself is designed to discourage over-tightening, and can stay at the ideal tension level for several hundred uses. Compared to the handful of other WORX products, this one is slightly smaller than its close cousin the WG304.1, which has a grander bar and chain and is more powerful. Best Uses: felling or cutting trees or wood upto 12 inches. Can also be used for firewood cutting and general limbing work. The WG303.1 is a corded electric chainsaw. Its ergonomic design makes for hours of comfortable work. Weighing only 11 pounds, it is quite lightweight. Two benefits can be gained by this, namely portability and safety through reduced handling risks. Speaking of safety, if the chainsaw experiences any sort of kickback an auto-stop mechanism comes into effect and brakes the chain. Almost all inexpensive chainsaws lack such safety features but the WG303.1 includes them. Thanks to the auto-tensioning system integrated into its design, the WG303.1 demands no chain tightening measures from you; it does it all on its own. This means you can still work the saw without the need to read up or practice on the technical aspects of it. In other words, you need no lumberjack training to use this power-tool. The previous feature also serves to extend the lifespan of the chain and bar component. It does this by removing any chance at over-tightening; there is a sizeable knob to secure the bar and chain. The metal bucking spikes that are part of the chain’s design help grip the wood while cutting. It works like a pivot and grants balance while performing varied yard-related tasks. The series of all-metal dogs situated at the base of the bar enhance stability. The WG303.1 boasts a 16-inch bar and chain. Providing longevity is the sprocket on the bar nose that is easy to lubricate. There is no oil leakage except for a little that spatters onto the chain. This is essential, of course, for chain lubrication lest it over-heats and blunts itself over time. Electric chainsaw reviews must be always neutral. So, here are some downsides of this product. It cannot perform heavy-duty work. You need a more advanced chainsaw to help with that. If you want to perform small to medium-duty cutting tasks, this is the best chainsaw for the job. While it can fell trees, it cannot cut through large trunks; gas chainsaws can do this better. 1. Usage – Never take undue advantage of the chainsaw. The WG303.1 may work like a charm but any form of abuse or over-work and the saw will put up its price. From delays to maintenance/repair costs, you will not be happy continuing with this product if you do not use it properly throughout. Maintenance is not a problem with this machine. It auto-tightens the chain, oils components when needed, brakes the chain in case of kickbacks, and imparts longevity to the device. Overall, the WG303.1 practically maintains itself. 2. 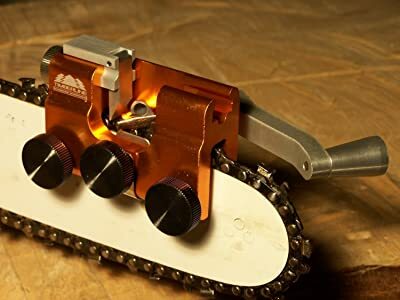 Extension Cord – Since this is an electric chainsaw, you cannot hope to have a lengthy stretch of wire to work around the yard. You get a standard length with the product, and below are ways to find the right extensions, if you need them. For a 100-foot extension cord, ensure that you buy 12-gauge wire. For a 50-foot extension cord, ensure that you buy 14-gauge wire. The right extension can make all the difference. Otherwise, the chain on the saw will run at reduced speeds, which will warrant extra heat energy. This willnegatively influence the chainsaw’s lifespan. 3. Safety – Wear protective industrial grade gloves whenever you handle chainsaws, the WG303.1 being no exception to the rule. Flying debris and related problems warrant the use of safety goggles. Fine dust that could rise into the air from certain sawing and cutting tasks demand a face mask or at least a handkerchief tied across the lower face. Even your clothes need to be tough without being overbearing. Chainsaws are not always safe,hence the need for such safety measures. If you need to clean up after a storm,cutting, trimming or wish to make firewood for use indoors (heating) , you will appreciate what the WORX WG303.1 can do. 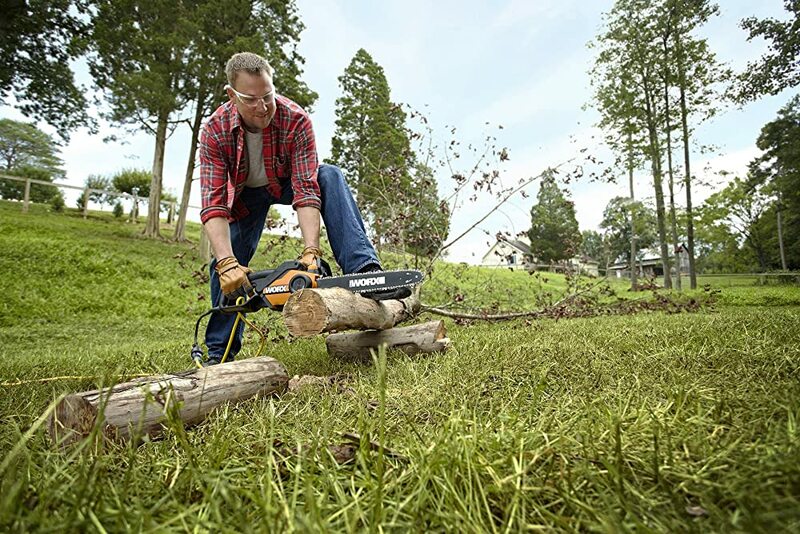 Without having to spend too much on it, the chainsaw helps take care of everyday yard work and rises to most emergencies. Aside from lasting several years (durability; this is a great money-saving benefit), the WG303.1 is a consistent performer and saves you time and technical fiddling (it has auto-tightening, auto-oiling, etc.). It is safe (brakes chain in case of kickback), has an ergonomic design (comfort, long-term use), and performs consistently well (efficiency). The WG303.1 works as good as most gas-powered chainsaws despite it being an electric chainsaw. To conclude one of our electric chainsaw reviews here we highly recommend it for small- to medium-duty cleaning, cutting, and other yard work.